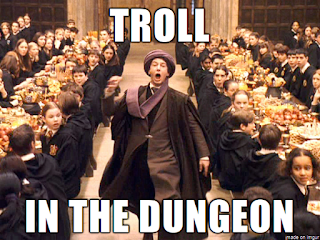 Gather 'Round the Table: Troll in the Dungeon! Play games. Tell stories. Have fun. 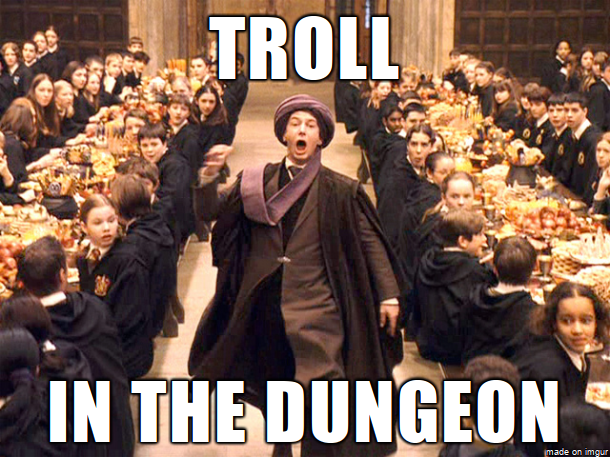 In case you aren't familiar with Harry Potter, there is a part in the first book (and movie) where a teacher runs into the crowded great hall and shouts that there is a troll in the dungeon. The school erupts in panic and hijinks ensue for the heroes. This is far from the most interesting or creative way to introduce a problem to your characters, but if you use it sparingly, it is effective. What better way to galvanize your PCs into action than by having an NPC burst in on them and scream that danger is nearby. Bonus points if that NPC immediately faints so that he or she cannot provide any other useful information. This is a very silly exercise, but here are some more urban fantasy threats that could appear in unlikely locations. 1. Zombies in the kitchen! 2. Imps in the chimney! 3. Nixies in the vents! 4. Goblins in the bathroom! 5. Minotaur in the hallway! 6. Efreeti in the back seat! 7. Dragon in the atrium! 8. Vampires in the elevator! 9. Witches on the veranda! 10. Gorgon in aisle 5! 11. Dark elves in the storage shed! 12. Sirens on the sound stage! I am Andrew Young, otherwise know as That One GM. I’m a gamemaster and game designer with a career in editing. In between covering documents with red ink, I create a bunch of RPG micro-content. Some of it I use, some of it I don’t. I thought I’d share my stuff in the event that other folks might find it interesting and/or helpful.